A filter press is a piece of equipment designed for batch process filtration intended to separate solids and liquids using pressure filtration driven by slurry feed pumps. Filter presses have been widely used since the mid-1800’s in many industries including Waste-water, Metals and Mining, Chemicals, Cosmetics, Flavors and Fragrances, Pharmaceutical, Industrial, and Beverage Markets. Filter presses can be defined by two basic types: Plate and Frame Filter Presses and Recessed Chamber Filter Presses. Recessed Chamber Filter Presses are a more modern design and can be further classified into three categories: Caulked and Gasketed Recessed Chamber Filter Press, Non-Gasketed Recessed Chamber Filter Press, and Membrane Squeeze Recessed Chamber Filter Press. Filter presses consist of two main components: the framework and the filter pack. The base framework (also referred to as the skeleton or carriage) is composed of a fixed head, a moving head, a closure system, sidebars (or overhead beam), and face piping. The filter pack (also referred to as the plate stack) consists of the filter plates stacked in order that create a hollowed chamber for solids collection between two drain fields which act as media supports. 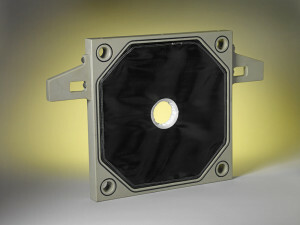 When the plates are held together in a plate pack the corner discharge eyes form individual manifolds connecting the drain-fields of the plates with the external piping of the press. 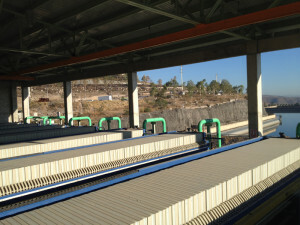 The major difference in the type of filter press is the style of plates used in the filter pack. A plate and frame filter press uses a filter pack that is made up of alternating plates and frames. A frame, as suggested, is a hollowed framework appropriately sized to match an associated plate. The frame is where slurry is pumped into and solids are retained. Frames usually have one or two activated ports for slurry to enter into the frame. The associated plate has pips or a milled surface to allow drainage into ports alternate to the activated inlet ports in the frame. The plate acts as a support for filter cloth, paper, or depth media, and the developed cake. A recessed chamber filter press uses a filter pack that is made up of recessed chamber filter plates. As the name suggest a recessed chamber filter plate contains a recess that makes up one-half of a hollowed chamber. Recessed chamber plate stacks consist of a Head Plate which has one half of a chamber, Internal plates which have one half of a chamber on both sides of the plate, and a tail plate which has one half of a chamber. As the plates are stacked the recesses form a complete chamber between two plates. Slurry is fed into the chamber through a center port (or less commonly a corner feed hole) as each chamber fills with slurry, the liquid passes through a cloth or paper medium, across the drain-field, through the drain ports and exits out of the comer discharge eyes. A Filter Press is as a “fixed volume, batch pressure filter.” The term “batch” refers to the operation of the filter press as a cyclical filtering device that requires interruption of the process to discharge the collected solids (filter cake). As a fixed volume filter, filter presses requires a specific quantity of solids in the total influent stream for the press to work effectively; if not filled to capacity with solids the filter cake will not reach its maximum potential for cake dryness. “Pressure” provided by the inlet slurry feed is used as the drying force in the separation process as opposed to vacuum, gravity, or centrifugal force. Filter presses are used in all aspects of the manufacturing cycle from production of goods to polishing filtration for final product development to waste stream sludge dewatering for disposal. Filter presses can be used to separate and retrieve the desired solids, liquids, or in some applications both. 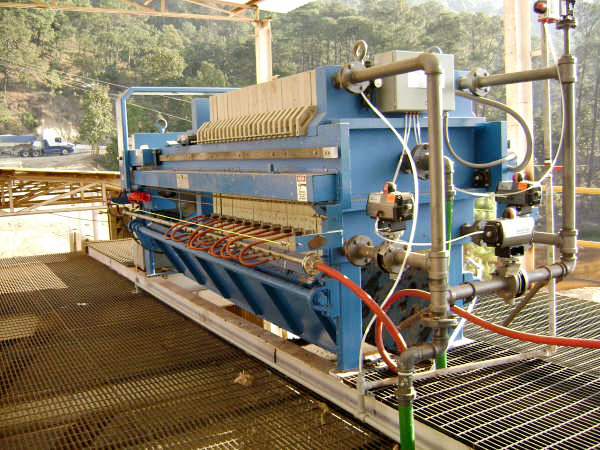 Filter presses are highly efficient, require little maintenance and operational expense, and are a cost effective solution for many filtration projects. ErtelAlsop manufactures filter presses from Laboratory Bench-Top models to over 283ft³ (8m³) Large Production Scale models utilized in high volume dewatering applications such as mining and wastewater sludge treatment. By erteladmin | Published March 27, 2015 | This article was posted in Chemical, Filter Equipment, Filter Press, Flavors and Fragrances, Food and Beverage, Pharmaceutical, Wastewater. Bookmark the permalink. Follow comments with the RSS feed for this post. Post a Comment or leave a trackback: Trackback URL.